Lobby + Campaign + Donate + Learn + Engage + Vote! The president calls America stupid, sides with Putin on Russian election meddling, separates children from their parents at the border and says Latino immigrants are infesting our country, echoing Nazi Germany. These are not the first nor the last cruel and un-American actions that twist many of us into knots of frustration and helplessness. Millions are asking, “What can we do?” There is no quick-fix pill or old-fashioned cane to pull this president off the stage. That’s not how democracy works. But I’m here to tell you the fix is available, and it starts right here, right now, with immediate action and a big push to shape the midterms coming up on November 6th. If you want to feel more optimistic and empowered, keep reading. America is in our hands. If we can flip the U.S. House and Senate to a Democratic majority, then they will serve as a counterbalance to the president, fill the courts with more balanced judges and, just maybe, craft some bipartisan legislation to fix our many problems. There are also 36 governorships up for grabs, and Democrats matter here, too, because they will be redrawing election districts, making it easier for everyone to vote (not harder) and implementing more progressive policies in support of things like affordable healthcare, a clean-energy future and a more equitable and inclusive society. And don’t forget about state legislatures and local races. If our federal government won’t protect us, then our states and localities will. Just look at the governors – nearly a dozen – who refused to send their National Guard troops to the border in defiance of the president’s family separation policy. More and more, we see that the grassroots – you and me – push upward with the power to make America better for everyone. Feeling Frustrated? Get More Engaged! Feeling exhausted, angry and frustrated? Instead of letting these emotions paralyze us, we can convert them into action, a good kind of conversion therapy. Here’s a practical, doable list of simple and effective actions. Pick and choose, make adjustments or add your own. Let’s get busy and spread the word, because the country we want is waiting on what we do together. ( 1 ) LOBBY your two U.S. Senators and one Representative once a week with a simple text using Resist.bot. Many of us don’t have the time nor like to make calls. All you do is text one brief message that is translated into a fax sent directly to all three offices. Your voice is heard! And I promise you, it will be more impactful than a rant on social media. You are applying pressure to power. And it feels good. TIME: 10 minutes a day. TOOL: Text “Resist” to 50409 and follow the prompts. IMPACT: Respectfully lobbying Congress or your state’s governor with our combined voices. For example, under intense pressure, the president halted his family separation policy. Trump is separating children from their parents, and he just referred to Latino immigrants as “infesting our country,” echoing Nazi Germany. Please take unconventional action to stop this. How about a U.S. House and Senate sit-in, a walk-out or calling for a national work-stoppage day across the entire country? Please band together with fellow Democrats and DO MORE to stop this and other cruel and un-American actions. Thanks for all you do. ( 2 ) CAMPAIGN for a Democratic candidate for a few hours a week in a district that is endangered or flippable (red-to-blue) in a congressional, gubernatorial or state legislative race. Democratic candidates will welcome your door knocking, phone banking, voter registering and other support, whether you live in their district or not. Below are some resources to get you connected. Just enter your ZIPcode or scroll the lists to see if there’s a race near you. You may need to do some extra Googling to find the Democrat running against the Republican, once all the state primaries are over. To get educated on the politics of your state, visit BallotPedia.org/State_Politics. TIME: 4 hours each week through November 6th. U.S. House: Use SwingLeft.org to find a flippable U.S. House race near you. Or check out the Democratic Congressional Campaign Committee’s Red-to-Blue list. State Legislatures: Check out the Democratic Legislative Campaign Committee’s state legislative Spotlight Races. IMPACT: Using your voice, hands and feet to help fill our government with people who share our progressive values. EXAMPLES: I will be campaigning for Democrat Jennifer Wexton in Virginia’s 10th District to replace incumbent U.S. Representative Barbara Comstock (R) and for Ben Jealous, the winner of the Democratic gubernatorial primary to replace incumbent Maryland Governor Larry Hogan (R). 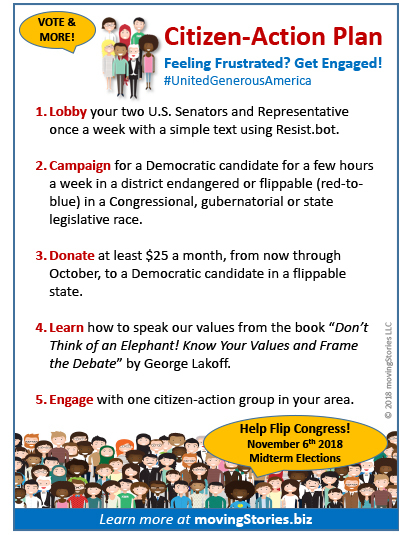 ( 3 ) DONATE at least $25 each month (through October) to a Democratic candidate in a flippable race. Candidates need money to win. So, cut back on some of your non-essential spending this summer and invest in America’s future. See the previous action point to find a candidate that excites you. TIME: 10 minutes once a month. TOOLS: Write a check or make a donation at the candidate’s website. IMPACT: Helping Democrats get their message out, so they can win in November and get America back on track. EXAMPLES: My donations will be split across Democrat Jennifer Wexton (noted above), Ben Jealous (Democrat for Maryland governor) and the smart and powerful Stacey Abrams, running to be the first black woman governor of Georgia. ( 4 ) LEARN how to talk about our values by reading “Don’t Think of an Elephant! Know Your Values and Frame the Debate” by George Lakoff. It’s a practical tool to empower your words. You will learn how to frame our progressive values and help others better see our point of view, using words like investments rather than taxes and protections rather than regulations. See how these words are more powerful, accurate and likable? Conservatives have long leveraged their own words, and now it’s time for progressives to speak loud and clear and win today’s culture war. Yes, actions speak louder than words, but words help change hearts and minds. TIME: 4 to 6 hours, spread over time. TOOL: Book in paperback, digital or audio. IMPACT: Take back the conversation by talking about our progressive values in ways that inspire and unite. EXAMPLES: My paperback is covered in yellow and pink highlighter, and I have a Notes file with key study points. ( 5 ) ENGAGE with a citizen-action group to get updates, find events and volunteer in the best way you can. Some have local chapters where you can join with others taking action and organizing in your community. Research them online, make contact, visit a few and find your people. Take a friend, or be brave and go alone. Nothing feels better than taking action on the ground and making new friends. This is how we build up America. TIME: 1-2 hours per week. TOOLS: We list a few of the many groups here. IMPACT: Working together with fellow Americans, leveraging expertise, tools and people power. EXAMPLES: I am engaged mostly with the first two. In a few months, we face an incredible election opportunity in the November 2018 midterms — and two years after that, the 2020 presidential election. We have inspiring work ahead of us. And now, you have some concrete ways to lobby, campaign, donate, learn and engage — and, of course, vote! Together, let’s commit to these actions, share this article and then ask friends, family and colleagues to join us! Don’t get angry, get busy.